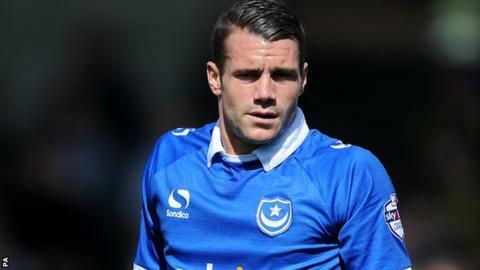 Portsmouth midfielder James Dunne says he has been frustrated after the club's waterlogged pitches meant he had to train in the gym last week. Dunne, 25, had knee surgery earlier this season and cannot train on the 3G surface with the rest of the squad. Team-mates Jack Whatmough, Adam Webster and Andy Barcham are also banned from using the artificial surface because of similar injury concerns. "You want to be with the rest of the boys," he told BBC Radio Solent. "We did some boxing on Tuesday, which was good fun, but it's better to be with the team. "Nobody can help it but because the training pitch is waterlogged, some of us aren't able to train all week. We train once or twice and the rest of the time I'm in the gym. "I've done my knee and for precaution, with the twisting and turning, we're not using the 3G so we don't make it worse." Dunne made his first start since his operation in the 1-1 draw with Burton at the weekend, having eased his way back with two substitute appearances. "I had to have the operation but hopefully it's all behind me now," he added.